Melissa is "Perfection" in her profession. I have been getting waxed for over 5 years and she continuously exceeds my expectations. Not only is she an excellent Aesthetician, she also cares about her clients and treats us as if we were a guest in her house. She waxes my eyebrows and other areas, and leaves me with a sense of satisfaction every time. If you want the best, GO SEE MELISSA!!!!" Girls get Date night ready! 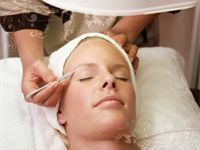 skin specific facial to prepare for your big day! Guys get Date night ready! What are the possible side effects and can they be minimized? What is a bikini wax vs. a brazilian wax? What do I wear during a brazilian wax? How long will a brazilian wax last?